The holiday hustle and bustle is here with a vengeance this year! I managed to catch the nastiest of colds right before Thanksgiving and it held on through last week, so I feel as though I lost a couple of weekends of preparation. Luckily my husband ant the kids picked up some of the slack and I’ve let other things go (more on that below) Most of the gifts are purchased though and my husband has done a lot of the wrapping. Now it’s just sorting through what’s in my closet where I hide gifts and finishing up the last of what’s needed. I’m also hoping to bake some more cookies this weekend. Somehow I never feel like we have enough cookies! I did an epic cookie baking weekend last weekend as a fundraiser for the school. We baked 680 DOZEN cookies – sugar cookies, spritz, peanut butter blossoms, Russian tea cakes, and turtles. Now I just need to make bourbon balls (a favorite of some of my co-workers) and krumkaka. I’ve been doing a lot of crocheting lately. 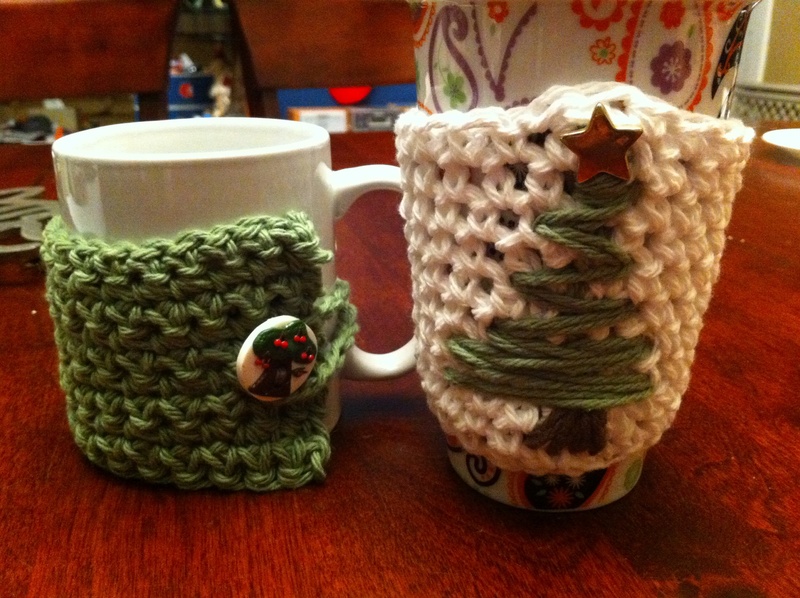 I agreed to make 20 mug cozies for my oldest daughter’s class. Every year the 5th Grade creates a business for the Christmas Concerts. Their job is to create crafts, market the items and sell them during the concerts. I’ve also been working on a reversible hat from Interweave Knits Gifts for the same daughter. The Stashbuster Hat is worked from the top down, then you switch yarns and work a second hat from the brim up. I found yarn in my stash (deep, deep in the stash) for this hat. Just yesterday I decided to try to whip out a couple of boot toppers for gifts. I know it’s crazy talk to start a project the weekend before Christmas and expect to get it done, but these really are fast knits. I’m not going to stress too much about whether they get done or not. Sometime around Thanksgiving I made the decision to not knit with a Christmas deadline in mind. I realize that this doesn’t make sense because I just said I was knitting the hat and boot toppers (plural?). However, the intent was to knit for pleasure, not stress out about a deadline. I’ve been that person knitting frantically in a bar with family on Christmas Eve trying to get the present done before the next morning. That’s not what I want this year. I want to just enjoy the knitting this year. The other motive behind this is to not knit for people who will not enjoy receiving the items. If the recipient is not “Knit-worthy” then I’m not knitting for them this year. I’m also not knitting for several people that are appreciative of my knitting just because my time is at a premium. Sometimes it’s a matter of not enough time in the day. I’m also not knitting a couple of projects that I had started earlier this month…. more on those a different day. They just took a backseat to the mug cozies and now to the other items I’m knitting. My knitting has been behaving very well recently. I mostly was making up the patterns for the mug cozies, so while there was some ripping of patterns that didn’t work out, it wasn’t anything that was too traumatizing. It was a really good way for me to learn some new crochet stitches on a small canvas. Let me know what you think of this format. My Boss is pushing me hard to start a podcast. I’m contemplating starting a podcast. If I can get all the details sorted out, then I may give it a try. Several years back I bought a recorder and headset to record with. Unfortunately the time to podcast was always slim to none in those days. As it is, I tend to write the blog while the kids are playing in the background or late at night in between putting kids to bed and tucking them back in two times. What I’m trying to say is that my house is not quiet or completely conducive to podcasting. The timing is just something I’m going to figure out. So tell me, would you listen to my very midwestern/up-nort accented voice talking about knitting?